Excuse us for living, but we have to stop eating like this. No, never! Pasta! And we save these recipes for our famous “Friday Nights.” (See the archives in the right margin, “Friday Night/Recipe Posts.”) Only when we are truly excited about a recipe do we share it with the world! Lagos, like many towns along the coast of Portugal, is historically linked to the sea. 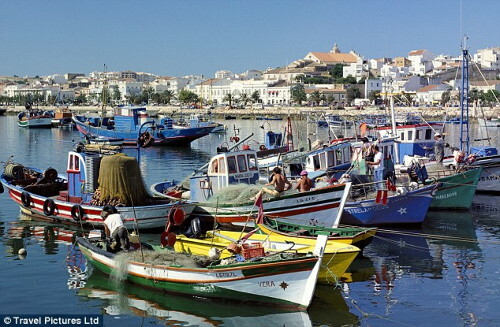 Fishing in Lagos goes back to ancient times as an important economic activity. More recently, tourism has surpassed the fishing industry. Lagos became most famous by the 15th century as the center of maritime exploration. Lagos was the home port of the famous Prince Henry the Navigator. If you remember your middle school social studies lessons, Prince Henry was most famous for being responsible for the sea explorations around the coast of Africa. For this one, the divine inspiration was two dear friends of ours. I worked with the husband of this couple, my teacher friend nicknamed, “Pacheeck.” He is of Portuguese-American extraction. And so through his influence I learned of the wonderful seafood tradition as a staple of Portuguese cooking and culture. We never got around to fishing together, but we did some ocean-going boating from his dockside home on several of his boats over the years. And so, one Friday Night, almost a year ago, I thought I might come up with a pasta dish with a Portuguese flair. That had to start with fish. I wanted it to have a tangy, fish taste, not too fishy, and be enticing, colorful. Do you remember Sea Legs? Well, don’t fault me, but that’s what I chose! 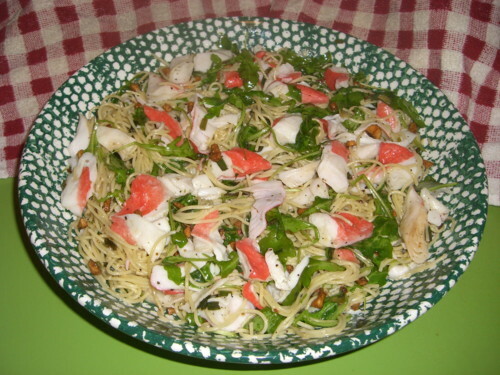 Sea Legs are an imitation crabmeat, or lobster, shrimp, or even scallops, depending on the flavoring added to taste like the desired shellfish. They are made most commonly from Alaskan Pollock. And again, depending on the desired shellfish, red coloring is added which is safe and healthy and gives the Sea Legs quite an appealing look. – – You can substitute Pollock itself for the Sea Legs, if you like, or any firm fish such as Tilapia, Sea Bass, or whatever you prefer. Top of the line would be to shell large crab claws. The brainstorming continued. Another teacher friend of mine, Al, a wonderful sage of a man who is no longer with us, loved arugula. No, he didn’t love arugula. He worshipped arugula! Why? I have no idea! I’ve had arugula in salad, naturally, or as an entire arugula salad. – – Nice, but nothing to write home about. But Al swore by arugula and pasta as his favorite dish! So why not? If it was good enough for Al to get excited about, why not give it a try? – – Arugula added to the recipe! Next, my last contribution to this concoction, before I handed it over to the Chef, wife Geri, came from a little Portuguese restaurant in central New Jersey we ate at last year. We had shrimp scampi tasting like it never tasted before. The chef and kitchen there minced the garlic finely but not too fine. Then they braised the garlic in oil, as usual, to a golden brown, not light and not dark. – – just right! And then (I think this is their secret to it all!) they highly salted the garlic like I would never have the nerve to do. But wow, was it good! So I suggested highly salted, minced brown garlic to complete the recipe. Then, as always, wife Geri worked her magic to turn one of my crazy ideas into a delectable pasta dish. She knows just what to do with my above suggestions. And then she knows just what to add. – – Some ground black pepper, braise some scallions along with the garlic. – – And measurements! How much Sea Legs? How much arugula? I don’t know! I cause all the fuss and Geri turns it into a recipe, a new creation! And so we have “Pasta Portuguese.” And I know I have said this before with other pasta recipes, but not only is this really good, it’s quickly become one of our favorites! Excuse us for living, but the living goes on with simple pleasures such as this! Comments: Please, before or after you try it! This looks so good but how would taste with Cod…I can’t have any shellfish whatsoever (well I can but you better have the casket right next to me). Wonderful blog! Have my mouth watering. And I loved reading about the brainstorming and all. The meal of piscard and pasta, she sounds a marvelous. My mouth shea be a watering. The Fontana Cuchina. Multi Bueano. Aromas beyond compare. I am quite familiar with the simulated crab meat. Very tasty. The beautiful combination of garlic along with the Magic of Chef Geri. Oh whata meal. The days of boats and dockside existence, another world. I guess you might say, “The Old World”. We had some fun. Beautiful. Springs a day away. Hooray!!! Cold winter here. Lots of turkey chili. Thanks for the cudos as an inspiration. My pleasure and honor. Now out to the store to get some of the ingredients. Only problem, Weezie is a surf type of gal. Turf is my love. Take care. Peace, All the Best to the Chef. Phil, when does the cookbook come out? I really want to get a copy of it. And you write so well, that the descriptions alone would be worth the price of admission! The unlocking and jail busting software are widely accessible online . its own software must be approved by Apple. Yes! jailbreak is a simple and safe also.